Two briefs (PDF pages) on the helical 3d printing and the wave-based generative design tools (in Japanese, sorry) are uploaded. Both are part of the brochure (partially written in English) used in MakerFaire Tokyo 2017. The main image of Dasyn's main shop in Yahoo! shopping was recently replaced. The new title contains photos of recent products and a copy, i.e., “why don't you replace your filament and fluorescent lamps by well-designed LED lamps?”. It also contains the name and mail address of Dasyn. Dasyn joins the Handmade Makers', which will open on November 10 to 12 at Pacifico Yokohama. Dasyn also joins 44th Design Festa, which will open on Nomvember 26 to 27 at Tokyo Big Site. Dasyn will exhibit and sell USB stand and pendant lamps with a brilliant-and-transparent shade and brilliant-and-transparent globes with USB- or battery-based LEDs. 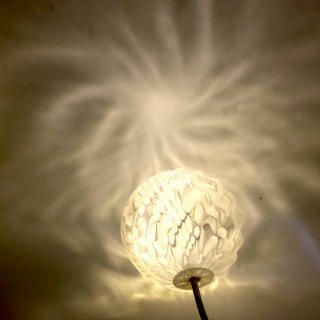 The USB stand and pendant lamps create attractive shades. Yasusi Kanada, who is the CTO of Dasyn.com, presented a talk titled “3D Printing by Using a Programming Language with Procedural Abstraction Function” (in Japanese) in IPSJ SIG Programming. This presentation proposes a method for generating G-code by describing an abstract Python program using a library for procedural 3D-design and for printing by a 3D printer, and shows use cases. A presentation focused on a method for mapping a bitmap on the surface of 3D-printed objects will be given in a conference called the 8th International Conference on Leading Edge Manufacturing in 21st Century (LEM21). Thin and seamless objects with pictures, characters, or other textures can be created by this method. 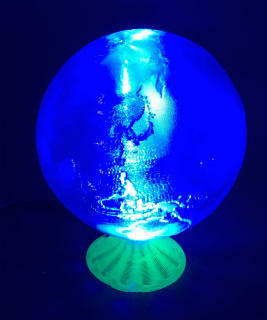 Several examples including transparent, thin, light, but strong globes and 3D calendars were created. Two presentations (in Japanese) on the new type of 3D design and printing will be given in the annual convention of the Japan Society of Mechanical Engineers on September 14. The first presentation is on a procedural design method for industrial products. The second presentation is on direction-specified 3D design and printing methods. The paper titled “Support-less Horizontal Filament-stacking by Layer-less FDM”, which was accepted for the SFF Symposium was presented in the afternoon on August 12. The session title is “Process Development VIII: New and Hybrid Process”. This paper describes a method for printing a thin, light, and brilliant objects, such as globe or heart-shaped dish without support material. A paper on natural-direction 3D-printing, which had been originally presented at the Solid Free-form Fabrication Symposium (SFF) 2013, was published. Another paper on hacked conventional 3D printing was also published. Both were published by the World Academy of Science, Engineering and Technology (WASET). A paper on 3D turtle graphics, which was originally presented and published in Japanese, has been published in English by the International Journal of Engineering Research and Applications (IJERA). 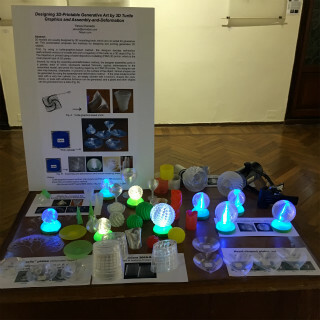 A paper on creating thin objects with bit-mapped pictures/characters, which has been used for printing globes, was accepted for a conference called the 8th International Conference on Leading Edge Manufacturing in 21st Century (LEM21). WASET is an NPO that organizes many technical conferences and that publishes many open-access papers at no cost. IJERA is a publisher of open-access papers at low cost. LEM21 is a conference organized by the Japan Society of Mechanical Engineers (JSME). A paper titled ““3D Turtle Graphics” by using a 3D Printer” has been accepted for the International Journal of Engineering Research and Applications, and a paper titled “Support-less Horizontal Filament-stacking by Layer-less FDM” has been accepted for the Solid Free-form Fabrication (SFF) Symposium. The SFF Symposium is a famous 3D-printing symposium with a long history. 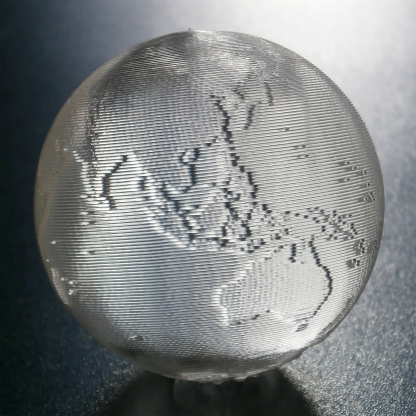 A video on printing an empty globe by using directed 3D-printing and deformation-based 3D-design methods were uploaded to YouTube (Creating a Globe by Helical 3D-printing Method). Products by using this method are sold in Yahoo! Japan shop (currently shipping within Japan only). Two videos on printing heart-shaped dish and cup by using directed 3D-printing and deformation-based 3D-design methods were uploaded to YouTube. The video of the dish is in this page. The video of the cup is in this page. Products by using these methods are sold in Yahoo! Japan shop (currently shipping within Japan only). Two videos on printing spheres by using directed 3D-printing and deformation-based 3D-design methods were uploaded to YouTube. One of them is on printing a sphere with vertically swinging head motion. The other is on printing a sphere normally. The second is an improved (much precise) version of previously uploaded video. Products by using these methods are sold in Yahoo! Japan shop (currently shipping within Japan only). Exploratory research results on fluctuated 3D printing was presented by Yasusi Kanada, who is the CTO of Dasyn.com, in the 20th International Workshop on Cellular Automata and Discrete Complex Systems (Automata 2014) as a short paper. A more detailed research results will be published as the book of the 8th International Workshop on Natural Computing (IWNC 2014). The latter will be published by a book in the series of Lecture Notes in Computer Science, which is published by Springer Verlag. A presentation titled “Developing Revolutionary 3D Design and Printing Methods” was given by Yasusi Kanada, who is the CTO of Dasyn.com, in BIT's 1st Annual World Congress of 3D Printing (BIT 3D) at Dalian in June 27-29, 2014. This presentation proposes direction-aware 3D design method, non-horizontal 3D printing method, and self-organizing and naturally-randomized 3D printing method. The abstract and preliminary slides are available here. The video on printing an olympic symbol is available at YouTube (saMdaqdlcxo (1x ver), FZZj6fGLls0 (8x ver)) or can be downloaded from Dasyn.com (1x ver), Dasyn.com (8x ver). The video on printing a self-organized pattern is available at YouTube (IJ15ysJR5l8) or can be downloaded from Dasyn.com. The video on printing a dish will be uploaded to YouTube soon. A preliminary version is available at Dasyn.com. Yasusi Kanada, who is the CTO of Dasyn.com, presented a talk and a paper titled “3D Printing and Simulation of Naturally-Randomized Cellular-Automata” in the International Symposium on Artificial Life and Robotics (AROB 2014) held at Beppu, Japan on January 22, 2014. 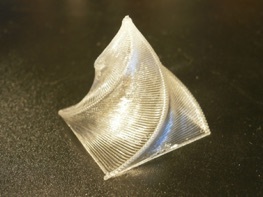 This paper describes the method and results of a unique type of 3D printing called “fluctuated 3D printing” demonstrated in Maker Faire 2013 in November 3 to 4, 2013. Two versions of videos on “natural-direction” 3D printing of Olympic rings as a chain was uploaded to YouTube. A summarized version with normal speed is on http://youtu.be/saMdaqdlcxo, and a whole version with 8x speed is on http://youtu.be/FZZj6fGLls0 . DASYN is developing innovative 3D printing technology. We have presented a poster on a new technology called the "natural-direction 3D printing" at the 24th SFF Symposium. The natural-direction 3D printing technology consists of field-oriented design technology, field-based tool-path generation technology, and non-horizontal (natural-direction-followed) 3D printing technology, which are patented and under development, and a new type of object model called the field-oriented solid model is used. 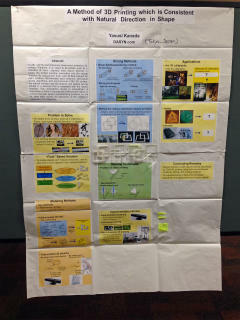 The poster explains the outline of these technologies and the field-oriented solid model. The abstract and the poster are available from the author's personal site. The programs and newly-developed technologies on WASS (Wikipedia Axis-Specified Search) will be published here soon. The original axis-specified search technology for World Encyclopedia is owned and patented by Hitachi, but the program and search method used in WASS has newly been developed by DASYN, and will be publicly available here. DASYN has a plan to develop technologies and programs on human communication and collaboration, and DASYN is developing several original technologies. The developing technologies include a combination of information extraction, retrieval, and organization technologies, which was developed and called "axis-specified search" by the DASYN's engineer and researcher. This technology was developed in Hitachi, Ltd. and was patented by Hitachi. However, because the power of computers and networks drastically increases after this initial development, and the available amount of text has become much larger, DASYN is developing very new methods to realize the objectives. DASYN will inform you about the development and technology through the Official blog. There is another blog titled 研究ノート (Research notes) which is an informal blog and usually written in Japanese (because it is easier for the researcher / engineer to write Japanese than English). Whitepapers (papers for customers) for introducing DASYN's visions and technologies will be published here. The technologies and inforamation of DASYN will be published by other media too. DASYN still do not have originally developed technologies. So web pages on the past work of the engineer / researcher is introduced here (However, most of the technologies described here are not owned by DASYN): Kanada's research themes. In addition, Kanada's research topics or its companion in Japanese describes on fusion of digital and analog and synergy of software and hardware. White space for the future!